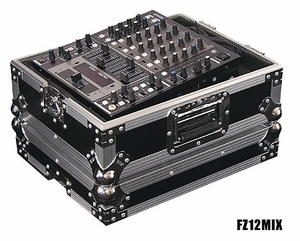 Transport your 12" mixer in style with our foam-lined Flight Zone mixer case. Features a slant-angle bottom to lift up the rear of the mixer for easier in-cse viewing of controls and displays. Convenient front panel provides full protection during transit but slides out for access to front mixer controls during use. The stackable lid doubles as an elevated base for those lower tables or taller DJs. Product Dimensions: What does this mean? Width Height Depth 15.5" 9.5" 19.5"